AWESOME SPECTACLE. Wild fire makes for awesome spectacle. Once, returning to Havre, Montana, from Glacier Park, we witnessed wild fire. Massive flames reaching twice as high as the trees that are burning. From there we drove the 200 miles to our destination and we could see overhead the entire distance a plume of smoke emanating from that fire in Glacier. In 1988 fire plagued Yellowstone Park where the debate over natural park land fires went on too long leaving thousands of acres of dense, dead, underbrush. Around that time (but not during 1988) fires burned all over the state of Montana. We could observe flames in the Bears Paw Mountains from the front window of my mother-in-law’s home in Havre. Needless to say, fire plays an important role on the Western landscape. Without it some pine cones could never open and reseed the land. Without it wildlife could not so easily find forest meadows. Without it the health of the forest is compromised as new growth has no chance in the shadow of aging large trees. Sometimes the wisest thing is to just let it burn. In recent years that has been happening more. The great fires in Yellowstone were lightening sparked and, while carefully monitoring, Park administrators let them burn. But then controversy broke out and the fires began threatening popular tourist locations within the Park. A tide of fire suppression crews were unleashed. One of the more dramatic moments was the fight to beat back flames threatening Old Faithful Inn. SAVING YELLOWSTONE. The sum result of all of this effort? Very little difference than had they just followed their original policy. The Yellowstone fires were extinguished by snow storms that arrive early every fall. As for Old Faithful, the wind shifted at the last minute. Otherwise there was nothing fire fighters could have done to save it. 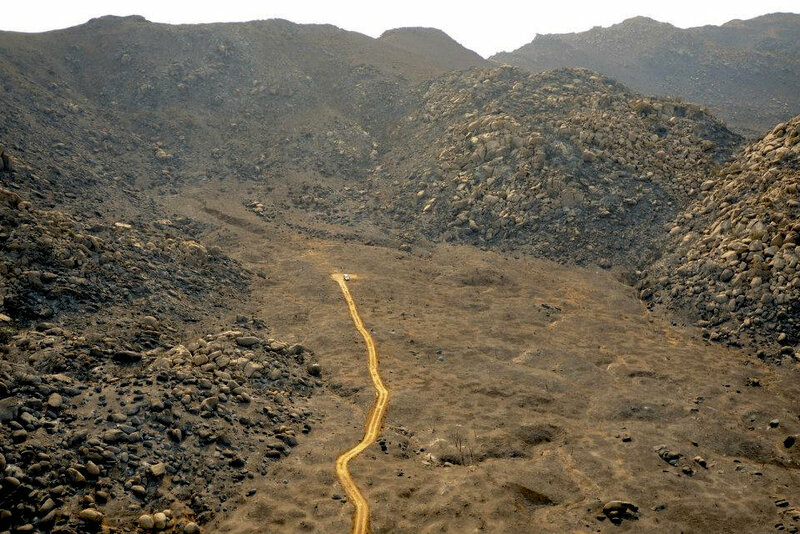 An aerial photograph of the site where 19 members of the Granite Mountain Hotshots, an elite firefighting crew, died. The visible road was made by a bulldozer to retrieve the bodies. YAHOOs IN SUVs. Living in the West we are continually reminded of how small and insignificant we humans are in the face of nature’s fury. Blizzards can strand whole communities for days, even weeks. Being out there when the worst of it hits can have life and death consequences. The Fort Collins yahoos who manage our condominium complex are so confident and brave when it comes to battling the elements on the 66 mile section of U.S. 287 that takes them home from meetings here in Laramie. They have their cute little Southern California style SUVs and so are not the least bit bothered about driving 15 miles an hour through blinding snow. Stay overnight and depart in the morning? Hah! Hah! Hah! Here in Wyoming we all learn the hard way the meaning of “Blowing Snow,” “Black Ice,” “Blizzard Conditions,” “Dangerous Cold,” and the like. Don’t approach a Moose to get a better picture. Give Bison a wide berth. Bring your dogs in at night so they don’t have a fatal encounter with some friendly Coyotes. Keep warm clothes, a shovel, and emergency kit in your vehicle. AAA is not a phone call away even if you can find cell service wherever it is you’re stuck. In dangerous weather conditions, never leave your vehicle. You might be 100 feet from safety and they’ll still find you a few days later frozen in the snow. To avoid getting burned up in a wild land fire, don’t build your house on the edge of a forest or grasslands system. GLOBAL WARMING? Ask a wild land fire fighter if she believes in global warming and there’ll be no hesitation in the response. Year on year we’ve seen more fires, bigger fires, more dangerous fires and coming in the midst of more and more serious drought conditions. Meanwhile the federal government keeps cutting forest management budgets. Projects that reduce underbrush, thin trees, are dropped as resources are directed into fire suppression. 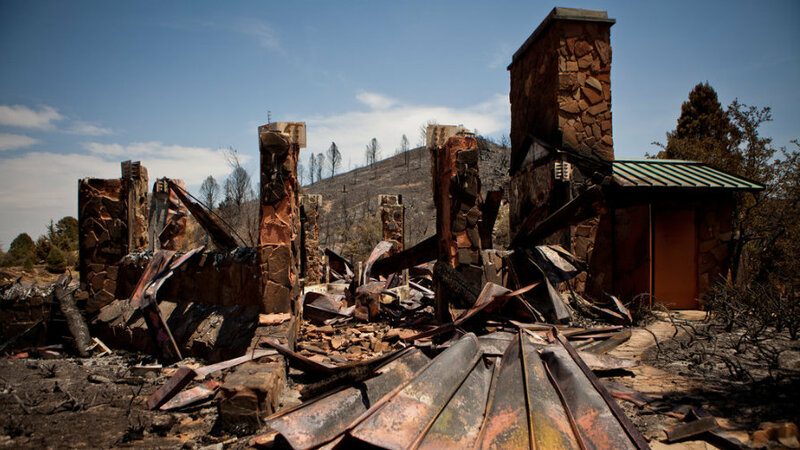 Where fires once could burn far from populated areas, now more and more effort is given to protecting houses located on forested land adjacent to the National Forest. Building a home adjacent to wild lands is the same as building a home right by an ocean beach. It will, in time, be destroyed by forces of nature. When a large forest fire was burning five miles from the Fort Collins city limits, one could overhear shi shi little SUV types bragging about “being evacuated” seeing as their homes were far enough from the urban area as to be threatened by the fire. When I arrived in Bozeman for a job interview and was staying in a hotel, I looked out my window to the north at night and saw these twinkling lights clustered at the base of the mountain range and wondered what they were. Pixies? Later I had opportunity to go hiking on a Forest Service trail I’d taken, like, 30 years earlier. The access point was flanked by houses seemingly built into the mountain. A high fence on either side of the trail for a few hundred feet. Wild land fire fighters risk and sometimes lose their lives protecting property located in the forest. Ask one of the property owners who lose this gamble and they’ll shed a tear; be thankful everyone in their family and their dogs got out; and then add that they have really good insurance and will rebuild soon. Anne Veseth, a 20-year-old Forest Service firefighter from Moscow, Idaho, died August 2012 after she was struck by a falling tree in north-central Idaho, highlighting the dangerous jobs crews have as at least a dozen blazes continue to burn across the state. WHAT CAN BE DONE ABOUT IT? An outright ban would be nice but completely unrealistic. Insurance companies at least could jack up the price of insuring a house in these situations. Zoning laws and insurance companies could require homeowners to cut back vegetation 100 feet from their home. Installing metal as opposed to asphalt roofing will help as well. It won’t stop the worst fire. Those Biblical fires we seem to be experiencing every summer these days. But the odds go up quite a lot. Visit Yellowstone Park today nearly 20 years following the great fires and one will see acre upon acre upon acre of Lodge-pole Pines that are taller than a tall man. The Park looks different compared with my years visiting there when friends were cleaning rooms and smiling at arriving tourists while welcoming them to Yellowstone. It’s just different, that’s all. 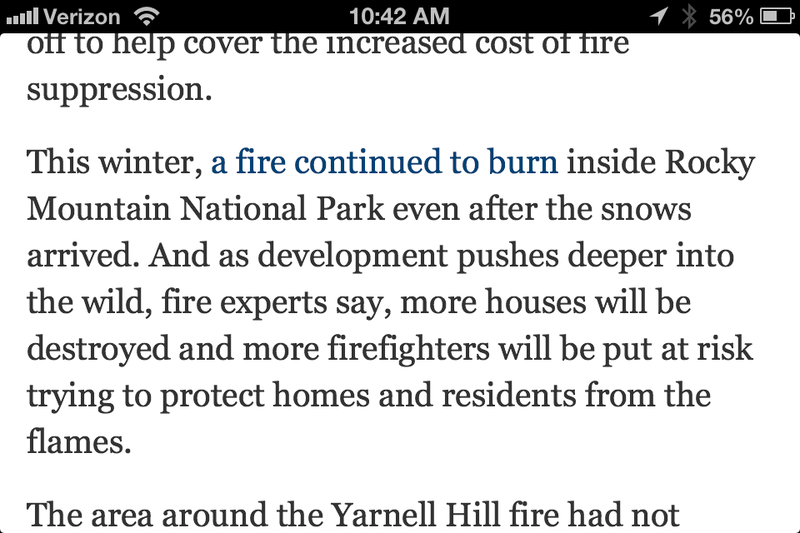 Besides, only a fraction of Park land experienced fire in those years. Forest fire hops, skips, jumps, with seeming randomness in the face of wind, cold fronts, topography. Yellowstone Park is a very big place. Too big to burn up in one bad season of summer fires. PINE BEETLE DEVASTATION. Since returning to the West about seven years ago it has been a real shock seeing the orange Pine Beetle killed forest throughout Montana, especially around Helena. This massive infestation is part of the natural cycle as well. Helped along a bit by forest management practices. Second growth trees following lumbering a century ago were just the right age to make them susceptible to the Pine Beetle. West of Missoula, however, in the Clearwater National Forest is a different story. A massive fire there destroyed thousands of acres of forest a lifetime ago. The trees that grew up in their place are too young for Pine Beetle infestation. Fire has a role to play. An important one. If we can just learn how to live with it; and stop trying to engineer it, we might fare a little better as the earth changes over years to come. This entry was posted on Sunday, July 7th, 2013 at 6:25 pm	and is filed under ESSAY, Grumbles, Havre, Idaho, Lewiston, Politics, Western Life. You can follow any comments to this entry through the RSS 2.0 feed. You can leave a comment, or trackback from your own site.